We’re counting down the five most popular songs in theBillboard Hot 100 Pop Singles chart, for the week ending October 24, 2015. When is a new song not a new song? Well…when it’s a returning song. We deal with just that situation this week. Let’s kick things off in fifth place, where Fetty Wap and Remy Boyz hold with “679.” There’s been trouble in Fetty’s camp. He recently parted ways with Remy Boyz member P-Dice for reasons that aren’t exactly clear. 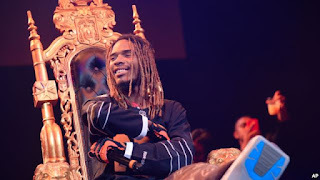 Website Vlad TV this week carried video footage of Fetty’s crew assaulting P-Dice after the split…with any luck, things won’t escalate from here. Last week, Silento left the lineup with his breakout hit “Watch Me”; this week, he’s back in the running. The Atlanta teenager just showed up as a guest on the remix of “Dessert,” the new single and video from Brooklyn, New York artist Dawin. The original video has logged more than 30 million views on YouTube. As anticipation builds for his next album, Justin Bieber encounters a setback this week, as “What Do You Mean” slips a slot to third place. On October 17, a mysterious duet with Selena Gomez briefly surfaced on OVO Sound Radio, before disappearing. Entertainment Tonight quotes a source as saying the song is three years old and will not appear on Justin’s new album. Drake got his start as an actor on the Canadian TV series Degrassi: The Next Generation. He tells W Magazine that he’d love to expand into movies…but nobody’s asking him. In the meantime, he’s still working on his next album,Views From The 6. He, Mark Ronson, and Bruno Mars lead all nominees for this year’s Soul Train Awards with five apiece…the show will air on November 29 here in the United States. So there’s your lineup for this week…and it all happens again in seven days!